The NBA is churning out a wonderful product right now, and last night’s game in Boston serves as a perfect example. LeBron James, the league MVP currently in the midst of an incredible winning streak with his Miami Heat, arrived in the city of his most bitter rival. Like it or not, Boston is still one of the league’s best atmospheres. And like it or not, Miami is still the best team in the league. Factor in Miami and Boston’s “hate” for each other, and you’ve got a recipe for a great night. Unfortunately, about an hour prior to tipoff, the Celtics announced that Kevin Garnett would not play. If the Celtics had a puncher’s chance to beat the Heat with Garnett on the floor, without him their chances were seemingly reduced to those of Glass Joe’s. But this was no ordinary night. Playing in his fifth game in seven nights, LeBron was focused, even before tipoff. After the Celtics’ introductions, James was the first man to take the floor. Well before the dancers had even cleared the court, James stood straddling the midcourt line like Roberto Duran waiting for Sugar Ray Leonard. 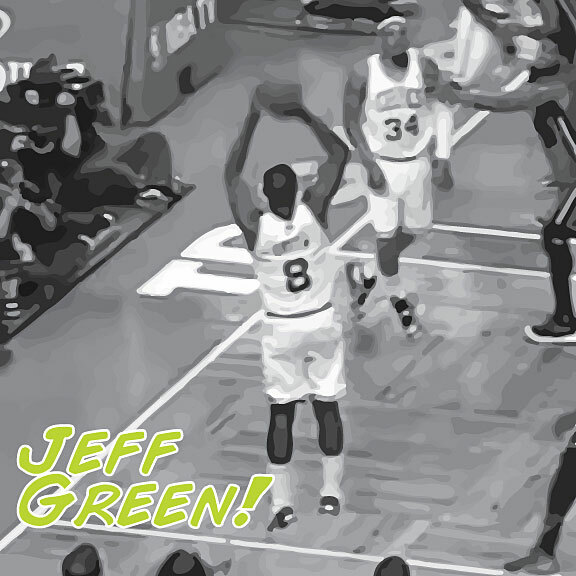 The first half was a tale of two players: Jeff Green and James. 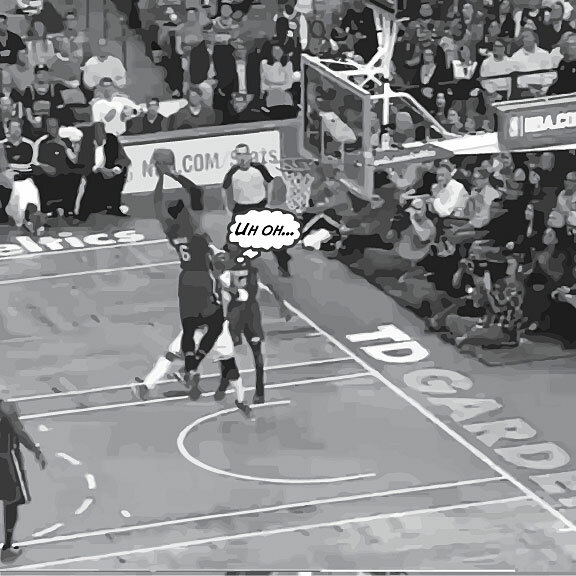 Jeff Green, the Celtics $9 million “meh” was off to a crazy start. Green has always been graceful in the open court, but the knock on him is that he’s not aggressive enough. Last night, Green was aggressive early and often, scoring 14 points in the first quarter (though by the time he had half of that, fans were already buzzing). Constantly attacking the Heat, getting to the rim, and finishing with beautiful layups, Green put up video-game numbers via an NBA Jam shot chart; all 12 of his first-half field goals were either at the rim or behind the arc. He repeatedly showed that Chris Anderson couldn’t guard him, beating him on multiple isolation plays and scoring easily off the dribble. 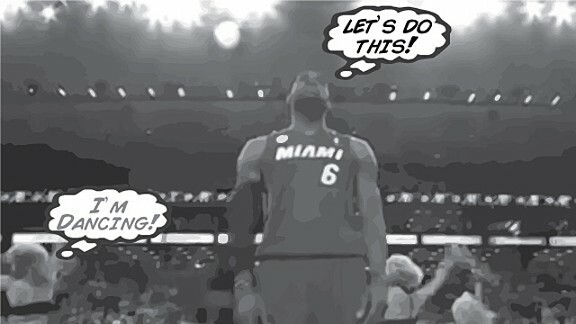 But the true beatdown and the ultimate highlight of the half belonged to LeBron. Halfway through the second quarter, after a Jason Terry steal, Dwyane Wade snuck up behind Terry as he neared mid-court. Wade deflected the ball to Mario Chalmers, who then passed to Norris Cole, who was jogging toward the right block. Cole, who probably could’ve laid it in, instead lobbed the ball up and back toward the edge of the restricted area. 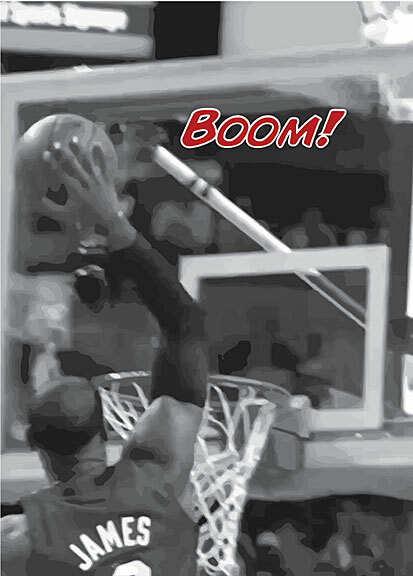 LeBron, who’d been trailing the play, leapt just inside the dotted circle, and in one vicious motion, caught the lob, crashed into Jason Terry, and threw down a very angry tomahawk dunk. With 5:22 left in the second quarter, Terry was on the floor in the Brandon Knight pose. The TD Garden, after being as loud as it had been all season, was suddenly some combination of awed, angry, and shocked. James stared down at the conquered Terry with such malicious intensity that he drew a technical foul. He had also just reminded everyone in the frenzied building of certain truths. Despite the Celtics opening up a 17-point lead in the first half, less than two minutes into the second half, the game was tied. The Heat went ahead 61-59 with 9:50 remaining in the third quarter, it looked like the Jeff Green honeymoon was over, and the night would end with the Heat simply asserting their dominance on the broken-down Celtics, but that didn’t happen; the Celtics continued to fight. At one point partway through the game’s final quarter, Boston was up 13. However, as an indicator to how scary this Heat team is, even that lead never felt safe. Sure enough, the Heat would come back with a vengeance. With 1:26 left in the fourth, the Celtics were up two, and the chant was “Beat the Heat!” After officials reviewed and overturned an out-of-bounds call, the Heat inbounded the ball to James, who missed a contested layup, but gathered his own rebound and put it back, tying the game at 103 with a play that was more Moses Malone than Michael Jordan. On the ensuing possession, the Celtics turned to Jeff Green, who couldn’t finish his final attacking layup. The teams then traded fruitless possessions, and with about 15 seconds remaining, James found himself isolated on Green out by the left wing. With a few stutters and jab steps, James created space between himself and Green, then rose to rattle in the 21-foot game winner. This is exactly the kind of shot that he wouldn’t have made a few years ago, but that now seems to go in every time. While it’s tempting to say LeBron is clutch now and wasn’t then, that fails to credit him for simply becoming a much better jump-shooter than he used to be. During his last few years in Cleveland, he was an average NBA shooter outside the restricted area, but now he’s much better. Part of this is improved skill; part of it is improved shot selection. But last night, nobody really cared about that. Last night, it was about seeing the Celtics push the Heat to the brink and almost pulling off a shocking upset. Despite the loss, the Celtics showed once again that they’re far from lifeless. Doc Rivers had his team more ready than anyone could’ve expected. They brought out the best in the Heat and the best in LeBron. Even without Kevin Garnett, they almost beat their bitter rival. And as much as these teams hate each other, if this night was any indication, we should all hope they meet again the playoffs.